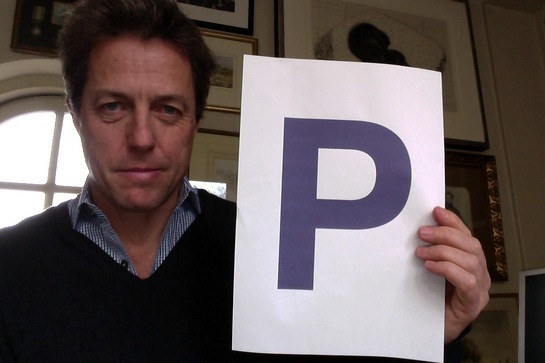 Hugh Grant, patron of charity Pancreatic Cancer Action, did his bit to raise awareness of pancreatic cancer by taking a photo holding a purple P.
Currently only 3% of those diagnosed with pancreatic cancer survive beyond five years. Pancreatic Cancer Action is committed to working towards earlier diagnosis of the disease so that surgery, currently the only cure, is made available to the sufferer. Other celebrities who are supporting the charity this month by holding letters, include Joanna David, the charity’s other patron who lost a good friend to pancreatic cancer, and Julie Hesmondhalgh, the actress who plays pancreatic cancer sufferer Hayley Cropper in Coronation Street. 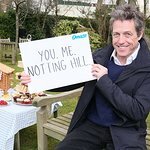 Other celebrities, including Gaby Roslin, Gemma Jones and Edward Fox, held letters for the charity to spell out the words “Pancreatic Cancer Awareness Month”. To find out more, click here or call 0303 040 1770.